Collins-Puri thinks girls are “too often left out of the design approach to STEM education.” When they choose to pursue STEM, “they are told that it’s not for them or they don’t belong.” she tells EdSurge. Techbridge Girls offers an alternative; its Girls Go Techbridge engineering design process “invites kids to brainstorm, design, build, test, and re-design.” Through the program, they learn to solve problems in real time, using skills that can be applied to a wide range of topics. Environmental education is one of the topics Techbridge Girls is working on through Changemakers, their year-long program where students work on group projects that will have an impact on their community. Recently, Changemakers won $100,000 as the grand prize winner of the UL Innovative Education Award from the North American Association for Environmental Education. (NAAEE). The staff at Techbridge Girls design interactive curricula that relate to current, relevant issues. When the Sonoma and Napa wildfires hit the Oakland community in 2017, Techbridge helped the girls understand the fires’ surprising ecological benefits and how the soil regenerates afterward. Through another curriculum, they learned how to take soil samples and survey the land. Professionals from a disaster/cleanup company taught them how to clean up in an environmentally sound way. Techbridge Girls collaborates with schools in the Bay Area via its Oakland headquarters; it also operates programs in two other regions, greater Seattle and Washington, DC. In addition, it collaborates with other organizations like the Girl Scouts to further expand its reach beyond those three areas. Hundreds of girls go through their free programs each year; this year, they expect almost 800 to take part. There’s no cost to students at present, though next year Techbridge is looking to launch a new initiative that will charge those able to pay an optional participation fee. The NAAEE is a natural collaborator for Techbridge’s Changemaker program. This pioneering membership organization is dedicated to accelerating environmental literacy and civic engagement through the power of education. 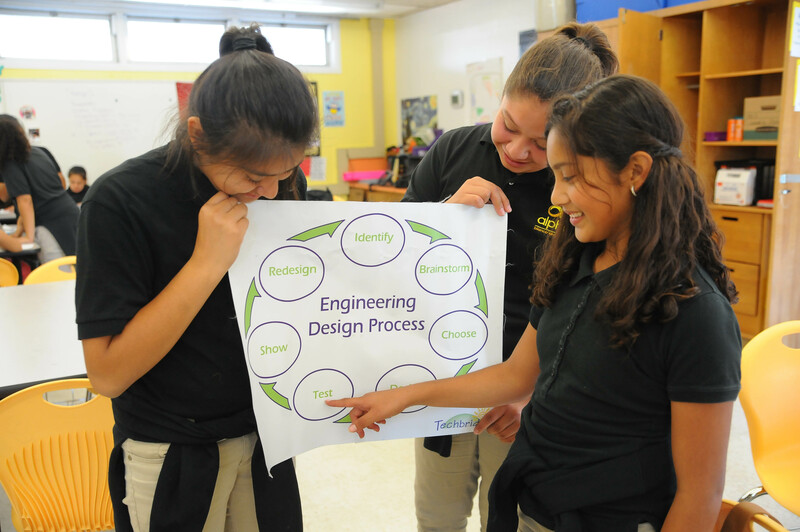 It works with both corporate and nonprofit partners to develop programs to advance E-STEM—the integration of environmental education into STEM.